The theory of games is a theory of decision making. It considers how one should make decisions and to a lesser extent, how one does make them. You make a number of decisions every day. Some involve deep thought, while others are almost automatic. Your decisions are linked to your goals—if you know the consequences of each of your options, the solution is easy. Decide where you want to be and choose the path that takes you there. When you enter an elevator with a particular floor in mind (your goal), you push the button (one of your choices) that corresponds to your floor. Building a bridge involves more complex decisions but, to a competent engineer, is no different in principle. The engineer calculates the greatest load the bridge is expected to bear and designs a bridge to withstand it. When chance plays a role, however, decisions are harder to make. … Game theory was designed as a decision-making tool to be used in more complex situations, situations in which chance and your choice are not the only factors operating. … (Game theory problems) differ from the problems described earlier—building a bridge and installing telephones—in one essential respect: While decision makers are trying to manipulate their environment, their environment is trying to manipulate them. A store owner who lowers her price to gain a larger share of the market must know that her competitors will react in kind. … Because everyone’s strategy affects the outcome, a player must worry about what everyone else does and knows that everyone else is worrying about him or her. There are at least two players. A player may be an individual, but it may also be a more general entity like a company, a nation, or even a biological species. Each player has a number of possible strategies, courses of action which he or she may choose to follow. The strategies chosen by each player determine the outcome of the game. Associated to each possible outcome of the game is a collection of numerical payoffs, one to each player. These payoffs represent the value of the outcome to the different players. …Game theory is the study of how players should rationally play games. Each player would like the game to end in an outcome which gives him as large a payoff as possible. 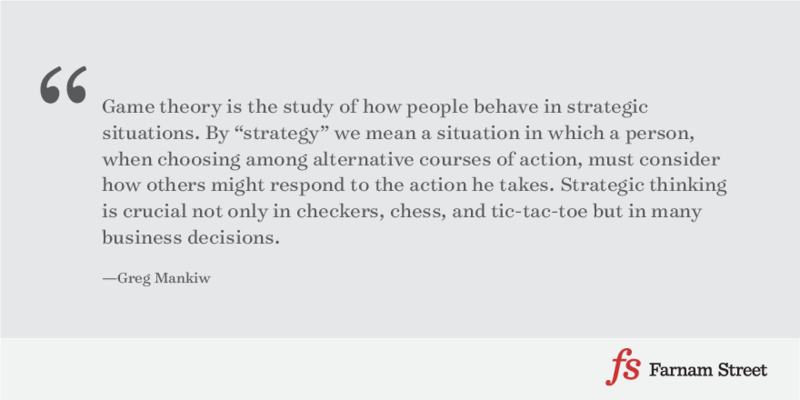 Game theory is the study of how people behave in strategic situations. By ‘strategic’ we mane a situation in which each person, when deciding what actions to take, must consider how others might respond to that action. Because the number of firms in an oligopolistic market is small, each firm must act strategically. Each firm knows that its profit depends not only on how much it produces but also on how much the other firms produce. In making its production decision, each firm in an oligopoly should consider how its decision might affect the production decisions of all other firms. Game theory is not necessary for understanding competitive or monopoly markets. In a competitive market, each firm is so small compared to the market that strategic interactions with other firms are not important. In a monopolized market, strategic interactions are absent because the market has only one firm. But, as we will see, game theory is quite useful for understanding the behavior of oligopolies. A particularly important ‘game’ is called the prisoners’ dilemma. Because an oligopolistic market has only a small group of sellers, a key feature of oligopoly is the tension between cooperation and self-interest. The oligopolists are best off when they cooperate and act like a monopolist – producing a small quantity of output and charging a price above marginal cost. Yet because each oligopolist cares only about its own profit, there are powerful incentives at work that hinder a group of firms from maintaining the cooperative outcome. Everyone’s best choice depends on what others are going to do, whether it’s going to war or maneuvering in a traffic jam. These situations, in which people’s choices depend on the behavior or the choices of other people, are the ones that usually don’t permit any simple summation. Rather we have to look at the system of interaction. How a firm interacts with other firms plays an important role in shaping sustainable value creation. Here we not only consider how many companies interact with their competitors, but how companies can co-evolve. Game Theory is one of the best tools to understand interaction. Game Theory forces managers to put themselves in the shoes of other players rather than viewing games solely from their own perspective. The classic two-player example of game theory is the prisoners’ dilemma. Game Theory is part of the Farnam Street latticework of Mental Models. See all posts on game theory.